Create your own gemstone choker inspired by a necklace worn by rock guitarist Jimi Hendrix! 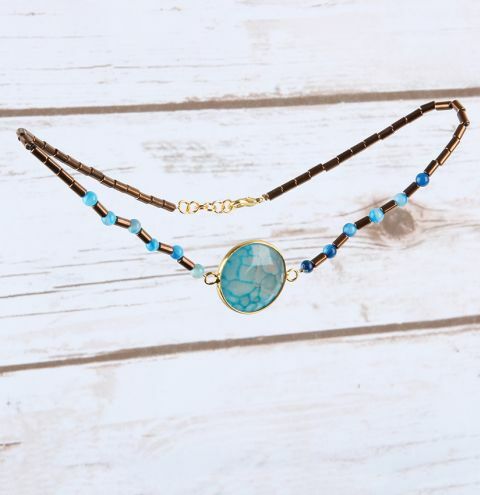 This shining choker features an agate connector charm at the centre and matching agate beads. Cut two lengths of monofilament measuring approx. 25cm each. Thread one end through a crimp bead and then through a loop on your agate connector coin charm. Thread back through the crimp bead and pull through a 4cm tail. Squash the crimp bead close to the connector charm to allow for a little movement. Repeat this for the other side of your connector charm for your other length of monofilament. Once you have secured both threads, start threading on your gemstone beads and bugle beads. Remember to thread the beads over the monofilament tail to hide it and add security. You may wish to take your neck measurement for a correctly fitting choker necklace. Remember to allow for the clasp and extention on the back of the necklace. Once you are happy with the length of your beaded sections thread a crimp bead onto the end, thread through a jumpring and back through the crimp bead. Thread your tail into your beaded section to hide it before squashing the crimp bead. Attach a lobster clasp and some more jumprings as extension chain until your choker is the length you would like.